Lori has deviously devised this sinful little game just for fun. 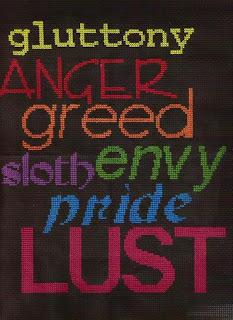 She has called it The Seven Deadly Sins. She wants me to tell her exactly how I get sinful. It sounds a bit naughty but she tagged me so I have to do it! If it looks like fun to you, consider yourself tagged, too. Gluttony. What can't you get enough of, even though it's bad for you? Wine, cheese, reality TV and celebrity gossip. Lust. What does it for you? The good old cliche...tall, dark and handsome. That's my man. He's still eye candy to me. Wrath. What makes you cranky? Not getting my own way, noisy noise (you know, motorbikes, kids screaming, that kind of noise), lack of sleep and pain. Envy. What makes you green? People with nice, new or completely renovated houses. Sloth. How do you relax? Reading, watching TV, spending time online. Pride. What are you inordinately proud of? My kids. They are amazing little beings. And the fact that I gave birth to them naturally and drug free (didn't necessarily intend to it just happened that way). Greed. What do you get greedy for? KFC (that's gross, I know!) But give me some mashies, popcorn chicken, and a tub of potato and gravy and I'm in greedy heaven. Ooh - I might join in a little later. Very sleep deprived here. I love birth stories Thea, do you have yours blogged anywhere...?